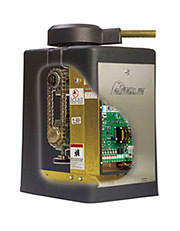 Eagle-100 Series Gate Openers - This Electric Residential Swing Automatic Gate Operator has been especially designed for Residential applications. The EAGLE -100 Electric Automatic Gate Openers combines smooth and quiet operation with the power and durability necessary for all commercial applications. . This model is manufactured in the U.S.A with dedication to safety, precision performance, and highly durable construction. Eagle Access Controls uses the latest in technology to provide you with the Safest and most effcient Automatic Electric Gate Operator for your money. The EAGLE-100 model is strong and dependable operator and ideally suited for residential applications. 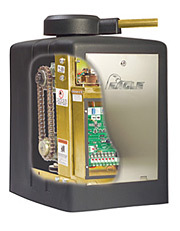 The Eagle-200 series is the premiere line of commercial swing gate operators for Eagle Access Controls. The Eagles-200 combines smooth and quiet operation with the power and durability necessary for all commercial applications. The models within this series are manufactured in the United States with dedication to precision performance. The EAGLE-200 1/2 HP model is driven by a quiet and powerful 1/2 Horsepower motor that can easily handle gates that weigh up to 1000 lbs. 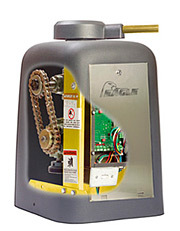 The Eagle-200 series is the premiere line of commercial Automatic swing gate operators for Eagle Access Controls. The Eagles-200 combines smooth and quiet operation for your Electric Gates with the power and durability necessary for all commercial applications. The models within this series are manufactured in the United States with dedication to precision performance. The EAGLE-200 1 HP model is driven by a quiet and powerful 2 1/2Horsepower motor that work simultaneously can easily handle gates that weight up to 1000 lbs. The Eagle-200 series is the premiere line of commercial Electronic Swing Gate Operators for Eagle Access Controls Remote Controls available separetly. The Eagles-200 Swing Gate Openers combines smooth and quiet operation with the power and durability necessary for all commercial applications. The models within this series are manufactured in the United States with dedication to precision performance. The EAGLE-200DM-Has (2) 1/2 HP Horsepower motors one to Swing open and one to Swing close that can easily handle gates that weight up to 1000 lbs. on heavy traffic areas. Safe and secure gate operation is made quick and easy with pad-mount gate operators fro Eagle. Enjoy quality and reliability with the Eagle-II Swing Gate Operator. Manufactured with the same quality and engineering as larger commercial and industrial gate operators, many of the advanced features you most often need come standard. Like every Eagle operator, the Eagle-II is built with heavy-duty AC motors, quiet gearboxes and quality components throughout. Install Eagle and install confidence.